NBC Sports Gold is a subscription over-the-top service with sports as its main focus. 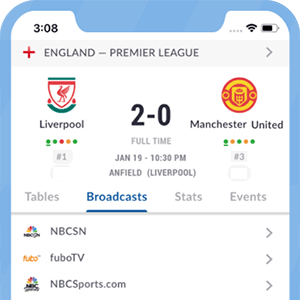 Owned by NBC Sports, NBC Sports Gold provides access to a number of sporting events via a "pass" system, which allows users to follow disciplines such as soccer, car racing, basketball, cycking, college football, rugby, motocross and track and field events. The football (or soccer) pass may include streaming of Premier League games each weekend, with up to three matches available to watch via this platform. NBC Sports Gold is available for iOS, Android, Apple TV, Amazon Fire TV, Chromecast and Roku users. *Got itLive Soccer TV does not provide NBC Sports Gold live streaming. The information provided on this page is simply NBC Sports Gold soccer TV schedule.